Your Business Community expects an actionable website with Current News, Calendar, Event Registrations, Business Directory, Advertisement, and Account Management. Los Angeles Internet Marketing Agency built its business through memberships in multiple Chambers of Commerce and Business Networking Groups in the Greater Los Angeles Area. With our thorough understanding of the Membership side and the Administration side of the Business Operations, our knowledge, and experience is an asset to any Association and Board of Directors. Our hands-on experience with implementing Cloud-Based Association Management systems like GrowthZone ensures that your vital day to day operations will not be impacted. Your Associations Website is a Tool for engaging your membership base while being a Marketing Tool for engaging your potential members. We work closely with your Board of Directors to understand your Association and specific needs. In partnership, we build websites that empower your Board of Directors and enable your Members to take action. Manage your back-end accounting and membership management from a user-friendly control panel. Manage your Members Public and Private information including Contact Information, Business Descriptions, and other details. Handle your Invoicing & Payment management all from the same centralized control panel. Manage private communications for your Board of Directors or with you Members. Leverage E-Mail for Blasting, Reminders, Invoicing, and other push notifications. OCR Scan Business Cards to collect Contact Information, Manage Members, Event Check-ins & Payments, and more. Los Angeles Internet Marketing Agency never charges for Chamber of Commerce Consultations and offers Preferred Pricing on Projects. We use industry standard CMS “Content Management Systems” like WordPress and Joomla, and SaaS “Software as a Service” like ChamberMaster and GrowthZone. We use HTML5/CSS3, jQuery, and Bootstrap to accomplish Mobile Ready design. 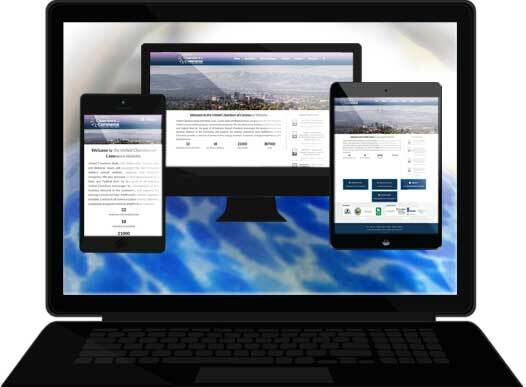 One website works equally well on Desktop, Tablet, and Mobile devices. All websites are created with Google, Yahoo, and Bing in mind. We diligently test our websites to ensure the page performance and content rank well. Keeping your CMS Software up to date is your first line of defense against hackers. Our Webmaster Services are designed to keep your site online, secure, and backed up at all times.